The Club meets the second Saturday of each month at 9:30 in the Ho'omaluhia Botanical Gardens vistor center. 21 degrees 23.212' North by 157 degrees 48.555' West. 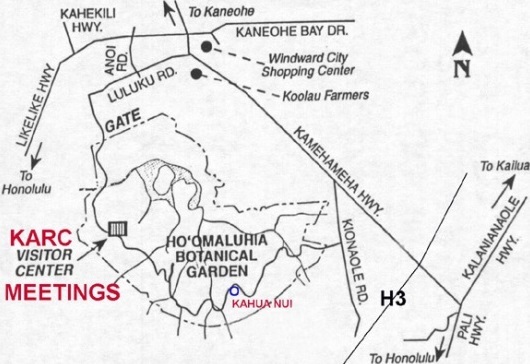 Watch for Koolau Farms on Kam Highway for the turn onto Luluku Road for the trip up to the park's main gate. 21 degrees 24.014' North by 157 47.964' West. 21 degrees 23.788' North by 157 degrees 48.458' West .